The Mush Monster Mouse can be found in the Labyrinth and Zokor. It is known to drop Cavern Fungus. The mighty Mushroom Monster Mouse is made from a mangled, mildewy, moist and mouldy maze of mushrooms! Meandering mindlessly in the murky, matchless and mostly undisturbed domains of the maze, these monstrosities remain. Their main milieu is an impeccable mix of modes that manages meaty mushroom multiplications, emboldening the mice to mature massively and mightily. The Mush Monster Mouse prefers Glowing Gruyere in both the Labyrinth and Zokor, but can be attracted with Standard Cheeses. Forgotten and Arcane weapons are very effective against the Mush Monster Mouse. 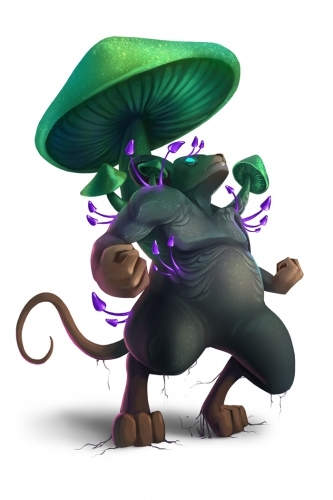 The Mush Monster Mouse can be found in Plain Farming, and Superior Farming. The Mush Monster Mouse can be found in the Farming Garden, and the Overgrown Farmhouse. The Mush Monster Mouse drops the Fungal Egg during the annual Spring Egg Hunt. 9 September 2015: The Mush Monster Mouse was introduced as part of the Hollow Heights release. This page was last edited on 27 May 2017, at 03:38.